[...] Most people today speak of "Christianity' as if it were a single specific thing a coherent, homogeneous and unified entity. Needless to say "Christianity' is nothing of the sort. As everyone knows, there are numerous forms of "Christianity': Roman Catholicism, for example, or the Church of England initiated by Henry VIII. There are the various other denominations of Protestantism from the original Lutheranism and Calvinism of the sixteenth century to such relatively recent developments as Unitarianism. There are multitudinous `fringe' or "evangelical' congregations, such as the Seventh Day Adventists and Jehovah's Witnesses. And there are assorted contemporary sects and. cults, like the Children of God and the Unification Church of the Reverend Moon. If one surveys this bewildering spectrum of beliefs from the rigidly dogmatic and conservative to the radical and ecstatic it is difficult to determine what exactly constitutes "Christianity'. If there is a single factor that does permit one to speak of Christianity', a single factor that does link the otherwise diverse and divergent "Christian' creeds, it is the New Testament, and more particularly the unique status ascribed by the New Testament to Jesus, his Crucifixion and Resurrection. Even if one does not subscribe to the literal or historical truth of those events, acceptance of their symbolic significance generally suffices for one to be considered a Christian. If there is any unity, then, in the diffuse phenomenon called Christianity, it resides in the New Testament and, more specifically, in the accounts of Jesus known as the Four Gospels. These accounts are popularly regarded as the most authoritative on record: and for many Christians they are assumed to be both coherent and unimpugnable. From childhood one is led to believe that the "story' of Jesus, as it is preserved in the Four Gospels, is, if not Godinspired, at least definitive. The four evangelists, supposed authors of the Gospels, are deemed to be unimpeachable witnesses who reinforce and confirm each other's testimony. Of the people who today call themselves Christians, relatively few are aware of the fact that the Four Gospels not only contradict each other, but, at times, violently disagree. So far as popular tradition is concerned, the origin and birth of Jesus are well enough known. But in reality the Gospels, on which that tradition is based, are considerably more vague on the matter. Only two of the Gospels -Matthew and Luke say anything at all about Jesus's origins and birth; and they are flagrantly at odds with each other. According to Matthew, for example, Jesus was an aristocrat, if not a rightful and legitimate king descended from David via Solomon. According to Luke, on the other hand, Jesus's family, though descended from the house of David, was of somewhat less exalted stock; and it is on the basis of Mark's account that the legend of the `poor carpenter' came into being. The two genealogies, in short, are so strikingly discordant that they might well be referring to two quite different individuals. The discrepancies between the Gospels are not confined to the question of Jesus's ancestry and genealogy. According to Luke, Jesus, on his birth, was visited by shepherds. According to Matthew, he was visited by kings. According to Luke, Jesus's family lived in Nazareth. From here they are said to have journeyed for a census which history suggests never in fact occurred to Bethlehem, where Jesus was born in the poverty of a manger. But according to Matthew, Jesus's family had been fairly well-to-do residents of Bethlehem all along, and Jesus himself was born in a house. In Matthew's version Herod's persecution of the innocents prompts the family to flee into Egypt, and only on their return do they make their home in Nazareth. The information in each of these accounts is quite specific and assuming the census did occur perfectly plausible. And yet the information itself simply does not agree. This contradiction cannot be rationalised. There is no possible means whereby the two conflicting narratives can both be correct, and there is no means whereby they can be reconciled. Whether one cares to admit it or not, the fact must be recognised that one or both of the Gospels is wrong. In the face of so glaring and inevitable a conclusion, the Gospels cannot be regarded as unimpugnable. How can they be unimpugnable when they impugn each other? The more one studies the Gospels, the more the contradictions between them become apparent. Indeed they do not even agree on the day of the Crucifixion. According to John's Gospel, the Crucifixion occurred on the day before the Passover. According to the Gospels of Mark, Luke and Matthew, it occurred on the day after. Nor are the Gospels in accord on the personality and character of Jesus. Each depicts a figure who. is patently at odds with the figure depicted in the others a meek lamblike saviour in Luke, for example, a powerful and majestic sovereign in Matthew who comes "not to bring peace but a sword'. And there is further disagreement about Jesus's last words on the cross. In Matthew and Mark these words are, "My God, my God, why hast thou forsaken me?" In Luke they are, "Father, into thy hands I commend my spirit." And in John, they are simply, "It is finished." Given these discrepancies, the Gospels can only be accepted as a highly questionable authority, and certainly not as definitive. 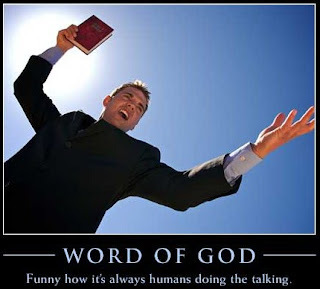 They do not represent the perfect word of any God; or, if they do, God's words have been very liberally censored, edited, revised, glossed and rewritten by human hands. The Bible, it must be remembered and this applies to both the Old and New Testaments is only a selection of works, and, in many respects, a somewhat arbitrary one. In fact, it could well include far more books and writings than it actually does. Nor is there any question of the missing books having been "lost". On the contrary they were deliberately excluded. In A.D. 367 Bishop Athanasius of Alexandria compiled a list of works to be included in the New Testament. This list was ratified by the Church Council of Hippo in 393 and again by the Council of Carthage four years later. At these councils a selection was agreed upon. Certain works were assembled to form the New Testament as we know it today, and others were cavalierly ignored. How can such a process of selection possibly be regarded as definitive? How could a conclave of clerics infallibly decide that certain books "belonged" in the Bible while others did not ? Especially when some of the excluded books have a perfectly valid claim to historical veracity? As it exists today, moreover, the Bible is not only a product of a more or less arbitrary selective process. It has also been subjected to some fairly drastic editing, censorship and revision. In 1958, for example, Professor Morton Smith of Columbia University discovered, in a monastery near Jerusalem, a letter which contained a missing fragment of the Gospel of Mark. The missing fragment had not been lost. On the contrary, it had apparently been deliberately suppressed at the instigation, if not the express behest, of Bishop Clement of Alexandria, one of the most venerated of the early Church fathers. Clement, it seems had received a letter from one Theodore, who complained of a Gnostic sect, the Carpocratians. The Carpocratians appear to have been interpreting certain passages of the Gospel of Mark in accordance with their own principles principles that did not concur with the position of Clement and Theodore. In consequence, Theodore apparently attacked them and reported his action to Clement. In the letter found by Professor Smith, Clement replies to his disciple as follows: You did well in silencing the unspeakable teachings of the Carpocratians. For these are the "wandering stars" referred to in the prophecy, who wander from the narrow road of the commandments into a boundless abyss of the carnal and bodily sins. For, priding themselves in knowledge, as they say, "of the deep [things] of Satan", they do not know that they are casting themselves away into "the nether world of the darkness" of falsity, and, boasting that they are free, they have become slaves of servile desires. Such [men] are to be opposed in all ways and altogether. For, even if they should say something true, one who loves the truth should not, even so, agree with them. For not all true [things] are the truth, nor should that truth which [merely] seems true according to human opinions be preferred to the true truth, that according to the faith. It is an extraordinary statement for a Church father. In effect Clement is saying nothing less than, "If your opponent happens to tell the truth, you must deny it and lie in order to refute him." But that is not all. In the following passage, Clement's letter goes on to discuss Mark's Gospel and its "misuse", in his eyes, by the Carpocratians: lAs for] Mark, then, during Peter's stay in Rome he wrote [an account of] the Lord's doings; not, however, declaring all [of them], nor yet hinting at the secret [ones], but selecting those he thought most useful for increasing the faith of those who were being instructed. But when Peter died as a martyr, Mark came over to Alexandria, bringing both his own notes and those of Peter, from which he transferred to his former book the things suitable to whatever makes for progress towards knowledge [gnosis]. [Thus] he composed a more spiritual Gospel for the use of those who were being perfected. Nevertheless, he yet did not divulge the things not to be uttered, nor did he write down the hierophantic teaching of the Lord, but to the stories already written he added yet others and, moreover, brought in certain sayings of which he knew the interpretation would, as a mystagogue, lead the hearers into the innermost sanctuary of that truth hidden by seven [veils]. Thus, in sum, he prearranged matters, neither grudgingly nor incautiously, in my opinion, and, dying, he left his composition to the church in Alexandria, where it even yet is most carefully guarded, being read only to those who are being initiated into the great mysteries. But since the foul demons are always devising destruction for the race of men, Carpocrates, instructed by them and using deceitful arts, so enslaved a certain presbyter of the church in Alexandria that he got from him a copy of the secret Gospel, which he both interpreted according to his blasphemous and carnal doctrine and, moreover, polluted, mixing with the spotless and holy words utterly shameless lies. Clement thus freely acknowledges that there is an authentic secret Gospel of Mark. He then instructs Theodore to deny it: To them [the Carpocratians], therefore, as I said above, one must never give way, nor, when they put forward their falsifications, should one concede that the secret Gospel is by Mark, but should even deny it on oath. For "not all true [things] are to be said to all men". What was this "secret Gospel" that Clement ordered his disciple to repudiate and that the Carpocratians were "misinterpreting" ? Clement answers the question by including a wordfor-word transcription of the text in his letter: To you, therefore, I shall not hesitate to answer the [questions] you have asked, refuting the falsifications by the very words of the Gospel. For example after "And they were in the road going up to Jerusalem," and what follows, until "After three days he shall arise", [the secret Gospel] brings the following [material] word for word: "And they come into Bethany, and a certain woman, whose brother had died, was there. And, coming, she prostrated herself before Jesus and says to him, "Son of David, have mercy on me". But the disciples rebuked her. And Jesus, being angered, went off with her into the garden where the tomb was, and straightway a great cry was heard from the tomb. And going near, Jesus rolled away the stone from the door of the tomb. And straightway, going in where the youth was, he stretched forth his hand and raised him, seizing his hand. But the youth, looking upon him, loved him and began to beseech him that he might be with him. And going out of the tomb they came into the house of the youth, for he was rich. And after six days, Jesus told him what to do and in the eveining the youth comes to him, wearing a linen cloth over [his] naked [body]. And he remained with him that night, for Jesus taught him the mystery of the kingdom of God. And thence arising, he returned to the other side of the Jordan." This episode appears in no existing version of the Gospel of Mark. In its general outlines, however, it is familiar enough. It is, of course, the raising of Lazarus, described in the Fourth Gospel, ascribed to John. In the version quoted, however, there are some significant variations. In the first place there is a "great cry" from the tomb before Jesus rolls the rock aside or instructs the occupant to come forth. This strongly suggests that the occupant was not dead and thereby, at a single stroke, contravenes any element of the miraculous. In the second place there would clearly seem to be something more involved than accepted accounts of the Lazarus episode lead one to believe. Certainly the passage quoted attests to some special relation between the man in the tomb and the man who "resurrects" him. A modern reader might perhaps be tempted to see a hint of homosexuality. It is possible that the Carpocratians - a sect who aspired to transcendence of the senses by means of satiation of the senses discerned precisely such a hint. But, as Professor Smith argues, it is in fact much more likely that the whole episode refers to a typical mystery school initiation a ritualised and symbolic death and rebirth of the sort so prevalent in the Middle East at the time. In any case the point is that the episode, and the passage quoted above, do not appear in any modern or accepted version of Mark. Indeed, the only references to Lazarus or a Lazarus figure in the New Testament are in the Gospel ascribed to John. It is thus clear that Clement's advice was accepted not only by Theodore, but by subsequent authorities as well. Quite simply the entire Lazarus incident was completely excised from the Gospel of Mark. If Mark's Gospel was so drastically expurgated, it was also burdened with spurious additions. In its original version it ends with the Crucifixion, the burial and the empty tomb. There is no Resurrection scene, no reunion with the disciples. Granted, there are certain modern Bibles which do contain a more conventional ending to the Gospel of Mark an ending which does include the Resurrection. But virtually all modern Biblical scholars concur that this expanded ending is a later addition, dating from the late second century and appended to the original document. The Gospel of Mark thus provides two instances of a sacred document supposedly inspired by God which has been tampered with, edited, censored, revised by human hands. Nor are these two cases speculative. On the contrary, they are now accepted by scholars as demonstrable and proven. Can one then suppose that Mark's Gospel was unique in being subjected to alteration? Clearly if Mark's Gospel was so readily doctored, it is reasonable to assume that the other Gospels were similarly treated. [...]Modern scholars are unanimous in concurring that the Gospels do not date from Jesus' lifetime. For the most part they date from the period between the two major revolts in Judaea - 66 to 74 and 132 to 135 although they are almost certainly based on earlier accounts. These earlier accounts may have included written documents since lost for there was a wholesale destruction of records in the wake of the first rebellion. But there would certainly have been oral traditions as well. Some of these were undoubtedly grossly exaggerated and/or distorted, received and transmitted at second, third or fourth hand. Others, however, may have derived from individuals who were alive in Jesus's lifetime and may even have known him personally. A young man at the time of the Crucifixion might well have been alive when the Gospels were composed. The earliest of the Gospels is generally considered to be Mark's, composed sometime during the revolt of 66-74 or shortly thereafter except for its treatment of the Resurrection, which is a later and spurious addition. Although not himself one of Jesus's original disciples, companion of Saint Paul, and his Gospel bears an unmistakable stamp of Pauline thought. But if Mark was a native of Jerusalem, his Gospel as Clement of Alexandria states was composed in Rome, and addressed to a Greco Roman audience. This, in itself, explains a great deal. At the time that Mark's Gospel was composed, Judaea was, or had recently been, in open revolt, and thousands of Jews were being crucified for rebellion against the Roman regime. If Mark wished his Gospel to survive and impress itself on a Roman audience, he could not possibly present Jesus as anti-Roman. Indeed, he could not feasibly present Jesus as politically oriented at all. In order to ensure the survival of his message, he would have been obliged to exonerate the Romans of all guilt for Jesus's death to whitewash the existing and entrenched regime and blame the death of the Messiah on certain Jews. This device was adopted not only by the authors of the other Gospels, but by the early Christian Church as well. Without such a device neither Gospels nor Church would have survived. The Gospel of Luke is dated by scholars at around A.D. 80. Luke himself appears to have been a Greek doctor, who composed his work for a high-ranking Roman official at Caesarea, the Roman capital of Palestine. For Luke, too, therefore, it would have been necessary to placate and appease the Romans and transfer the blame elsewhere. By the time the Gospel of Matthew was composed approximately A.D. 85 such a transference seems to have been accepted as an established fact and gone unquestioned. More than half of Matthew's Gospel, in fact, is derived directly from Mark's, although it was composed originally in Greek and reflects specifically Greek characteristics. The author seems to have been a Jew, quite possibly a refugee from Palestine. He is not to be confused with the disciple named Matthew, who would have lived much earlier and would probably have known only Aramaic. The Gospels of Mark, Luke and Matthew are known collectively as the "Synoptic Gospels', implying that they see "eye to eye' or "with one eye' which of course, they do not. Nevertheless there is enough overlap between them to suggest that they derived from a single common source -either an oral tradition or some other document subsequently lost. This distinguishes them from the Gospel of John, which betrays significantly different origins. Nothing whatever is known about the author of the Fourth Gospel. Indeed there is no reason to assume his name was John. Except for John the Baptist, the name John is mentioned at no point in the Gospel itself, and its attribution to a man called John is generally accepted as later tradition. The Fourth Gospel is the latest of those in the New Testament composed around A.D. 100 in the vicinity of the Greek city of Ephesus. It displays a number of quite distinctive features. There is no nativity scene, for example, no description whatever of Jesus's birth, and the opening is almost Gnostic in character. The text is of a decidedly more mystical nature than the other Gospels, and the content differs as well. The other Gospels, for instance, concentrate primarily on Jesus's activities in the northern province of Galilee and reflect what appears to be only a second- or third-hand knowledge of events to the south, in Judaea and Jerusalem including the Crucifixion. The Fourth Gospel, in contrast, says relatively little about Galilee. It dwells exhaustively on the events in Judaea and Jerusalem which concluded Jesus's career, and its account of the Crucifixion may well rest ultimately on some first-hand eye-witness testimony. It also contains a number of episodes and incidents which do not figure in the other Gospels at all: the wedding at Cana, the roles of Nicodemus and Joseph of Arimathea, and the raising of Lazarus (although the last was once included in Mark's Gospel). On the basis of such factors modern scholars have suggested that the Gospel of John, despite its late composition, may well be the most reliable and historically accurate of the four. More than the other Gospels, it seems to draw upon traditions current among contemporaries of Jesus, as well as other material unavailable to Mark, Luke and Matthew. One modern researcher points out that it reflects an apparently first-hand topographical knowledge of Jerusalem prior to the revolt of A.D. 66. The same author concludes, "Behind the Fourth Gospel lies an ancient tradition independent of the other Gospels." This is not an isolated opinion. In fact, it is the most prevalent in modern Biblical scholarship. According to another writer, "The Gospel of John, though not adhering to the Markian chronological framework and being much later in date, appears to know a tradition concerning Jesus that must be primitive and authentic." Paul "the Liar" and Qumran "the Damascus"